I recently found my wrestling figures in storage. So may figures and you could tell they been played with. Its funny even with no articulation what so ever, my brother and I had so much fun with them. Rowdy Roddy Piper "Hot Rod"
Great toys no articulation what so ever to be played with. Look at almost every LJN WWF Superstars figure released between 1984 and 1989 and you'll notice something common among nearly all that survived -- they've got lots of playtime evidence. One of the most popular products during the WWF's massive growth, these wrestling figures bucked a lot of the action figure trends at the time. Despite their shortcomings in the articulation department, these wrestling figures were actually a lot of fun to play with. LJN did an excellent job of capturing the likenesses of the wrestlers and WWF personalities. They might not have the same level of detail as today's McFarlane figures or those put out today by Hasbro, but it's still easy to tell who the wrestlers are. Roderick George Toombs (April 17, 1954 – July 31, 2015), better known by his ring name "Rowdy" Roddy Piper, was a Canadian professional wrestler and actor. In professional wrestling, Piper was best known to international audiences for his work with the World Wrestling Federation (WWF, later WWE) and World Championship Wrestling (WCW) between 1984 and 2000. Although he was Canadian, because of his Scottish heritage he was billed as coming from Glasgow and was known for his signature kilt and bagpipe entrance music. He earned the nicknames "Rowdy" and "Hot Rod" by displaying his trademark "Scottish" rage, spontaneity, and quick wit. Described by industry veteran Ric Flair as "the most gifted entertainer in the history of professional wrestling", Piper is regarded by many as the greatest wrestling villain of all time. One of the most recognisable pro wrestling stars worldwide, Piper headlined numerous pay-per-view cards, including the WWF and WCW's respective premier annual events, WrestleMania and Starrcade. Never a world champion, he nevertheless accumulated 34 championships in various promotions during a 42-year ring career. 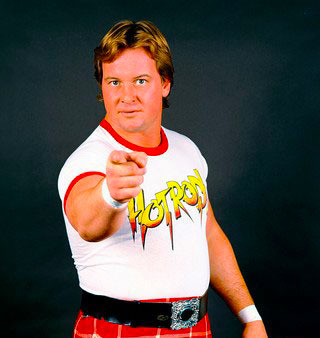 Piper's most notable rivals included Greg Valentine, Adrian Adonis, and Hulk Hogan, with the feud against Hogan – also involving "Captain" Lou Albano and singer Cyndi Lauper – considered the beginning of "Rock 'n' Wrestling". He was inducted into the WWE Hall of Fame in 2005. Outside of wrestling, Piper acted in dozens of films and TV shows, including the lead role of John Nada in the 1988 cult classic They Live and a recurring role as a deranged professional wrestler on the FX comedy series It's Always Sunny in Philadelphia. I have to add at least a couple of these guys to my vintage collection.They were too popular back in those days for me not to.